Last time, we showed the code for a Movie class, which stored data for a single movie. The next step is to create some Movie instances and put them in a list, which we will then bind the ListBox to. 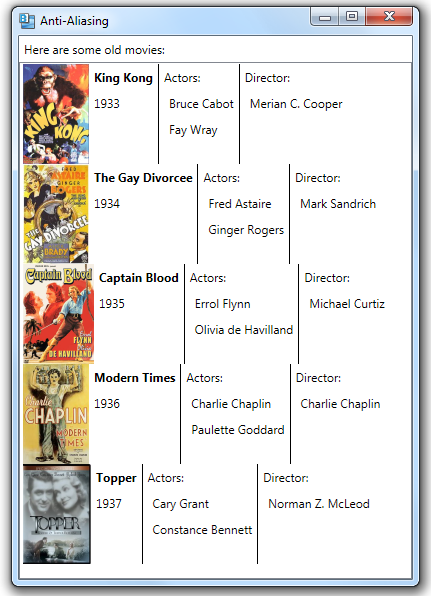 We start by adding a property containing a list of movies, which we will bind to. Next, we’ll add some code to set the data context of the main window to itself–which allows data binding GUI elements in the window to properties in the code-behind class that represents the window. We also add code to the constructor to populate the list of movies. // elements in the GUI to properties in the code-behind.